After going to Walt Disney World for many years with my grandparents, along with my parents and siblings, I now travel as a parent myself with my kids and their grandparents! As a result of this multi-generational travel to Disney World, there are some Walt Disney World rides that are better for all ages than others. This post is about my top Disney Rides for multi-generational guests – and by far the best Disney rides for grandparents and the grandkids to do together! The reason these rides made it to my list is because they do not have height requirements so even the youngest grandchild can be with grandma and grandpa. Also, these rides are, for the most part, pretty tame so grandparents can enjoy the experience. Plus, the attractions have little to no frightening features that might scare young children. 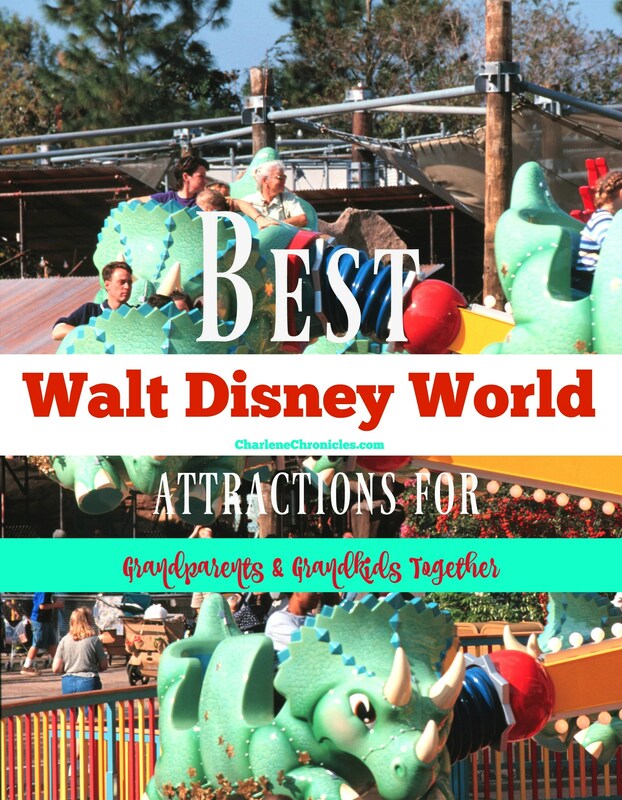 So these are my picks for the Best Disney World Attractions for Grandparents and Grandkids. 1. 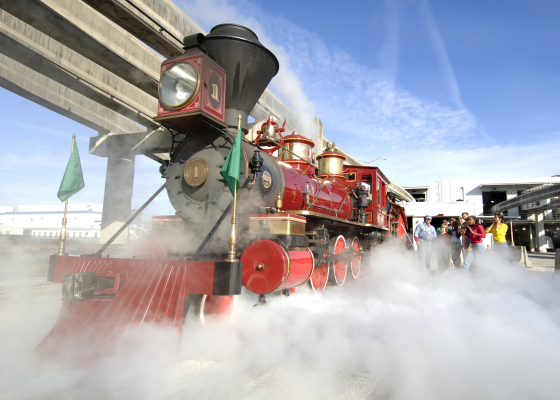 Walt Disney World Railroad – take the train around the entire park or use it as a way to cut down on walking towards the back of the park. Either way, it is a leisurely ride that is suitable for all ages! 2. Jungle Cruise – Set sail on a whimsical and comedy filled cruise through Disney’s version of an exotic river! Kids will love the boat ride and the grandparents will love the whitty comments from the ‘captain’! 3. The Magic Carpets of Aladdin – Fly high on a magic carpet cart – similar to Dumbo’s Ride. A fun ride and not too fast. See if you can get ‘sneezed on’ by the giant Camel! 4. Liberty Bell Riverboat – An old fashioned paddle river boat that sails around Tom Sawyer’s Island. It is a great place to relax, see different views of Magic Kingdom! 5. Its a Small World – Take a boat tour to see cultures from around the world. Young and old will enjoy the leisurely boat and the song and animatronics will entice and enchant everyone. Our Papa is known to use this as an opportunity to get a snooze. 6. Peter Pan Ride – With characters that young and old both know, guests can magically fly on a ship over London and Neverland. 7. The Many Adventures of Winnie the Pooh – another attraction with a character that all know, little ones will like the bouncing ride while grandparents will like the whimsy in riding an an oversized honey pot through Hundred Acre Wood. 9. Under the Sea ~ Journey of the Little Mermaid – Take a ride that magically descends you under the sea to see Ariel and her Friends. It is a smooth ride for young and old, with a beloved story to watch. 10. Dumbo the Flying Elephant – Ride your favorite elephant in this whimsical and quiet ride. Grandparents will enjoy the view of the park and kids will love the circus atmosphere. 11. Tomorrowland Speedway – I still have fond memories of taking my grandmother around the track and her enduring my bumpy driving – kids will love taking their grandparents for a car ride and the grandparents will love seeing the future drivers getting their first experience behind the make-believe wheel! 12. Tomorrowland Transit Authority PeopleMover – designed to be a mass transit system of the future, it is a fun place to people watch, see the park from a different vantage point and relax too. Grandparents will like the soothing ride and little ones may even take a brief nap along with grandpa. 13. Buzz Lightyear’s Space Ranger Spin – Fire make-belief lasers to defeat The Toy Story’s Zurg in this shooting gallery inspired game. Young and old will like the arcade feel and who will get the most points! 14. Astro Orbitor – Similar to the Magic Carpets of Aladdin and Dumbo the Flying Elephant, this is a simple but out-of-this world ride with amazing views of Tomorrowland. Optional: Pirates of the Caribbean attraction doesn’t have a height requirement and is a fun boat ride to enjoy with lots of animatronics to excite, but there are some dark places and scary scenes that may make it difficult for younger guests. The same can be said for the Haunted Mansion. The Carousel of Progress will delight parents and grandparents but younger kids may be bored. Bonus: Casey Jr. Splash ‘N’ Soak Station in New Fantasyland is a great place for kids to cool off and grandparents to cool down in and near this water play area. It is accessible without having to stand in a cue for an attraction. Also make sure to head over to Tom Sawyer’s Island too in Frontierland. 1. Spaceship Earth – On a moving ride that explores the innovations of mankind, gradnparents will love the historical component while kids will love the stars, the ride and the technology. 2. The Seas with Nemo and Friends – This ride takes you alongside characters from Finding Nemo with the end of the ride depositing you in an aquarium feature that kids and grandparents will enjoy. 3. Living with the Land – Sail through greenhouses to see how the future of food may be grown in this leisurely boat ride. Grandparents will love the information and kids will love the boat! 4. Journey into Imagination With Figment – Follow a magical purple dragon that will inspire young and old to imagine anything they want! The end of the ride enables kids and grandparents to play in an interactive feature. 5. Gran Fiesta Tour Starring The Three Caballeros: This is a fun boat excursion to discover the sights and sounds of Mexico. Great learning opportunity for all ages and a fun, cooling ride too! 6. 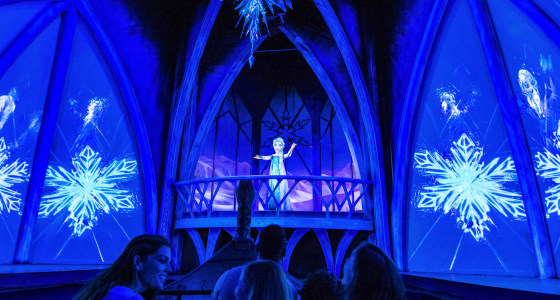 Frozen Ever After: A new attraction at the Norway Pavillion! Learn more about it here! Optional: Ellen’s Energy Adventure – Go back in time to the age of dinosaurs to see how energy plays a part of our lives now. Adults will love the information, and some kids will like the Dinosaurs. However, the ride is long and hard to leave, so it may not be suitable for some and the dinosaurs may scare some children. 1. 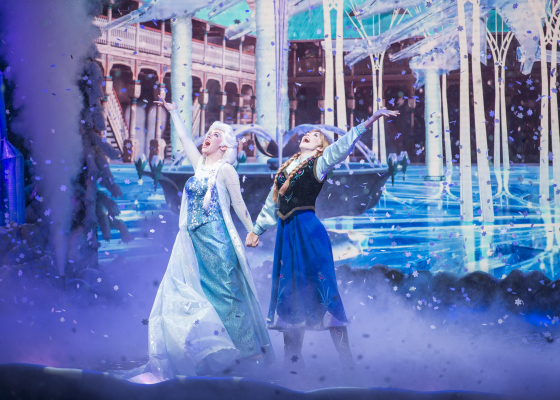 For the First Time in Forever: A Frozen Sing-a-Long Celebration – Anna, Elsa, Kristof and two grandparent-like ‘historians’ provide a fun performance for young and old. Kids will love seeing the characters from their favorite movie, while grandparents can get a crash course on the story. The two ‘historians’ make it funny for grandparents and parents, and fun for younger guests. It’s a great place to sit in a cool spot too. 2. Toy Storia Mania – This is a midway-style 4D ride with arcade like shooting games with Toy Story Characters. By far one of our family favorites. It is easy to operate for little ones (and just a fun little ride) and grandparents will like the arcade flavor of the attraction. Let’s see who gets the higher score – the kids or the grandparents! 3. Disney Junior Live! – This is a fun show with animatronics and live cast featuring favorite Disney Junior Characters. Kids and grandparents can sit and relax out of the heat as they sing to the famous songs! 4. The Great Movie Ride – This is a gliding ride that takes you on a journey through Hollywood’s famous films – kids will see some of their favorites as will two generations before them! 5. The Muppet Vision 3D – Experience the Muppets in a 3D film with interactive muppet interactions. Some kids may not know the Muppets but their cuteness will overcome the lack of awareness, and Grandparents will know the characters. Optional: Indiana Jones Stunt Spectacular – Most kids will love the action and the grandparents will love learning about how the action is created. It is a nice place to sit and has coverings to stay out of the sun. However, due to the load noises and explosion, it might be too sensitive for the younger and older guests. Best Attractions and Rides at Animal Kingdom without Height Requirements: Perfect for Multi-generational Disney Guests! 1. Kilianjaro Safaris – This is a safari ride through the African savannah creation at Disney’s Animal Kingdom. Grandparents will love showing the grandkids everything from Giraffes to Elephants. The ride is not too bumpy so babies and grandparents will enjoy the leisurely trip. 2. 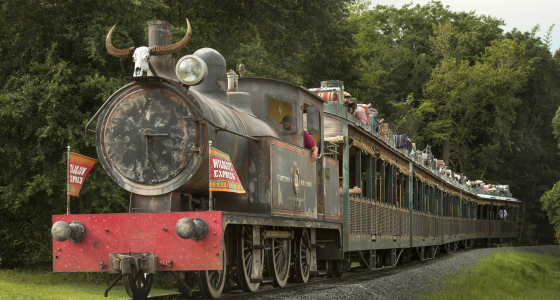 Wildlife Express Train – This train takes you behind the scenes of the Harambe Africa part of the park to Rafiki’s Planet Watch, which has places to explore, learn and interact with some animals. Kids and grandparents will like the train ride, and then exploring the activities together when the train arrives. 3. Tricera Top Spin – Similar to the Dumbo ride most of us know in Magic Kingdom, this is a easy flying ride in dinosaur type carts. No height requirement and it is not too fast either. 4. Trail and Treks – While this is not a standalone ride, there are lots of trails (like the Discovery Island Trails) and treks (like the Maharajah Jungle Trek) that are self-guided walking tours where you can see animals from tigers to bats. Kids and kids-at-heart will love seeing the animals, and the treks are easy to navigate, with plenty of places to sit along the way too, for young and old. Optional: It’s Tough to be a Bug – This is a 3D show that shows what it’s like to be a bug from The Bug’s Life movie. There are some creepy-crawly moments in the dark which makes this an optional activities, but there is no height requirement and a place to sit out of the heat. Bonus: The Boneyard – This is a great place for grandparents to take a break in the shade while kids play and explore. Other things to do with young and old together is to enjoy experiences like Character Dining, The Pirates League or the Bibbity Bobbity Boutique, and the Quests at Magic Kingdom, Epcot and Animal Kingdom. Don’t forget afternoon parades if kids are no longer napping or nighttime spectaculars if the kids are old enough to make it to closing time.